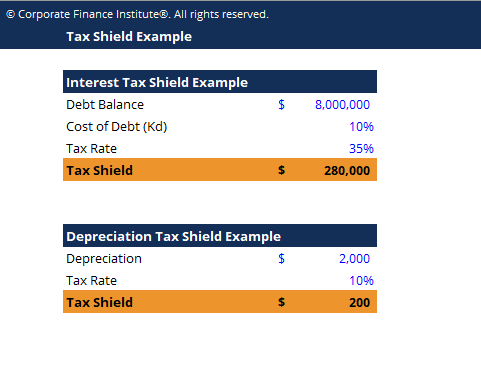 This tax shield example template shows how interest tax shield and depreciated tax shield are calculated. A Tax Shield is an allowable deduction from taxable incomeEarnings Before Tax (EBT)Earnings Before Tax (EBT), is found by deducting all relevant operating expenses and interest expense from sales revenue. Earnings Before Tax is used for analyzing the profitability of a company without the impact of its tax regime. This makes companies in different states or countries more comparable that results in a reduction of taxes owed. Tax shields differ between countries and are based on what deductions are eligible versus ineligible. The value of these shields depends on the effective tax rate for the corporation or individual (being subject to a higher rate increases the value of the deductions). Common expenses that are deductible include depreciationDepreciation ExpenseDepreciation expense is used to reduce the value of plant, property, and equipment to match its use, and wear and tear over time. Depreciation expense is used to better match the expense of a long-term asset to the revenue it generates., amortization, mortgage payments and interest expenseInterest ExpenseInterest expense arises out of a company that finances through debt or capital leases. Interest is found in the income statement, but can also be calculated through the debt schedule. The schedule should outline all the major pieces of debt a company has on its balance sheet, and calculate interest by multiplying the. There are cases where income can be lowered for a certain year due to previously unclaimed tax lossesNOL Tax Loss CarryforwardA Tax Loss Carryforward (also called a Net Operating Loss NOL carryforward) is a mechanism firms can use to carry forward losses from prior years to offset future profits and therefore lower future income taxes. The way a Tax Loss Carryforward works is that a schedule is generated to track all cumulative losses, which from prior years.